A History of Corporate Financial Reporting provides an understanding of the procedures and practices which constitute corporate financial reporting in Britain, at different points of time, and how and why those practices changed and became what they are now. Its particular focus is the external financial reporting practices of joint stock companies. 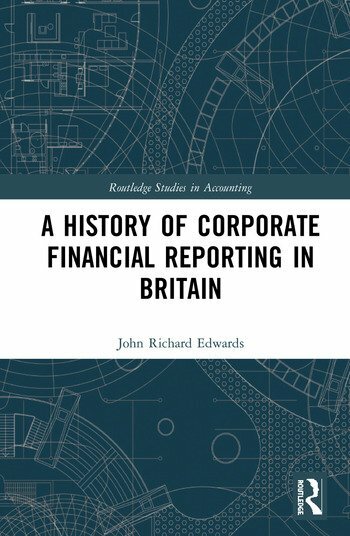 This is worth knowing about given the widely held view that Britain (i) pioneered modern financial reporting, and (ii) played a primary role in the development of both capital markets and professional accountancy. The book makes use of a principal and agent framework to study accounting’s past, but one where the failure of managers always to supply the information that users’ desire is given full recognition. It is shown that corporate financial reporting did not develop into its current state in a straightforward and orderly fashion. Each era produces different environmental conditions and imposes new demands on accounting. A proper understanding of accounting developments therefore requires a careful examination of the interrelationship between accountants and accounting techniques on the one hand and, on the other, the social and economic context within which changes took place. The book’s corporate coverage starts with the legendary East India Company, created in 1600, and continues through the heyday of the statutory trading companies founded to build Britain’s canals (commencing in the 1770s) and railways (commencing c.1829) to focus, principally, on the limited liability company fashioned by the Joint Stock Companies Act 1844 and the Limited Liability Act 1855. The story terminates in 2005 when listed companies were required to prepare their consolidated accounts in accordance with International Financial Reporting Standards, thus signalling the effective end of British accounting.